Do you have ancestry in the Ballarat area? 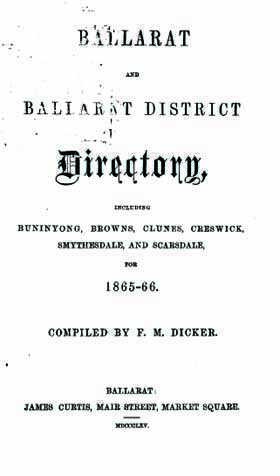 The full title is "Ballarat and Ballarat District Directory including Buninyong, Browns, Clunes, Creswick, Smythesdale and Scarsdale for 1865-66", Compiled by F.M. Dicker. The directory concludes with over 50 pages of advertisements - all useful information, often including names of people and places. It's a terrific genealogy resource for anyoe exploring their family history or building a family tree.